A scene from Iranian-Canadian Composers of Toronto's The Journey: Notes of Hope. Photo: Farshid Soleimanpour. There have been many stories told in every art form of late about immigration, migration and displacement. Our country knows its fair share of émigré stories, many of which have been turned into operas and musicals. But no story has been quite so moving as the one told by Iranian-Canadian Composers of Toronto (ICOT), the remarkable and now well-known collective in the city which has recently set Bänoo Zan’s visceral but mystical suite of poetic aphorisms as a chamber opera titled The Journey: Notes of Hope (seen Nov. 2nd & 3rd). It tells the compelling story of one person’s migration and subsequent re-discovery of her own culture and heritage after she has arrived in Canada. Falling squarely in the 20th-century monodrame tradition established by Schoenberg, The Journey eloquently narrates the psychological voyage of its only character, a thoughtful and vulnerable Syrian migrant, Sargardan (soprano Zorana Sadiq), who traverses isolation, loneliness and despair from being excluded in a new and often alien culture. However, as the monodrame unfolds, her journey becomes inwardly guided toward self-acceptance through fusion with the mystical divine. Her journey is as personal as it is collective, figurative as it is literal, told in minimalist terms in Bänoo Zan’s uniquely visceral style, at times part ancient Persian lyrical art, and at others, part multi-textured but subtly layered verse-prose. 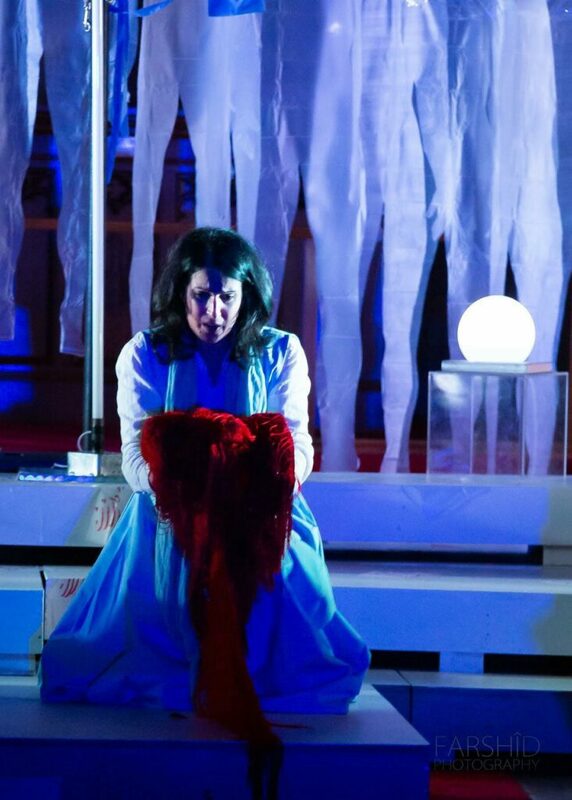 Bänoo Zan’s libretto is struck through with a concentrated poetic vision of the Islamic transcendent divine. In this way, the centrality of Sargardan served as proxy for all displaced Islamic women and eventually, for all of us in the audience too. Her story became ours, whether we are migrants or not. Zorana Sadiq (Sargardan) in Iranian-Canadian Composers of Toronto’s The Journey: Notes of Hope. Photo: Farshid Soleimanpour. As testimony to the generalized applicability of the story, the audience viewed a stage draped, literally, with plastic cut-out human figures two metres tall made from shower curtains. Set and costume designer Anahita Dehbonehie’s blue and green faceless migrants were illuminated by Frank Donato’s uncanny lighting effects (remarkable, on a shoestring budget). Eerily shadowed effects in muted tones served to distance us from the realities of the many hardships encountered by political and factional displacement. The effect made me think of war and its horrors which are easy to dismiss on a continent that has begun to make many of its émigrés feel unwelcome, despite their circumstances overcoming systematic persecution and human rights violations. 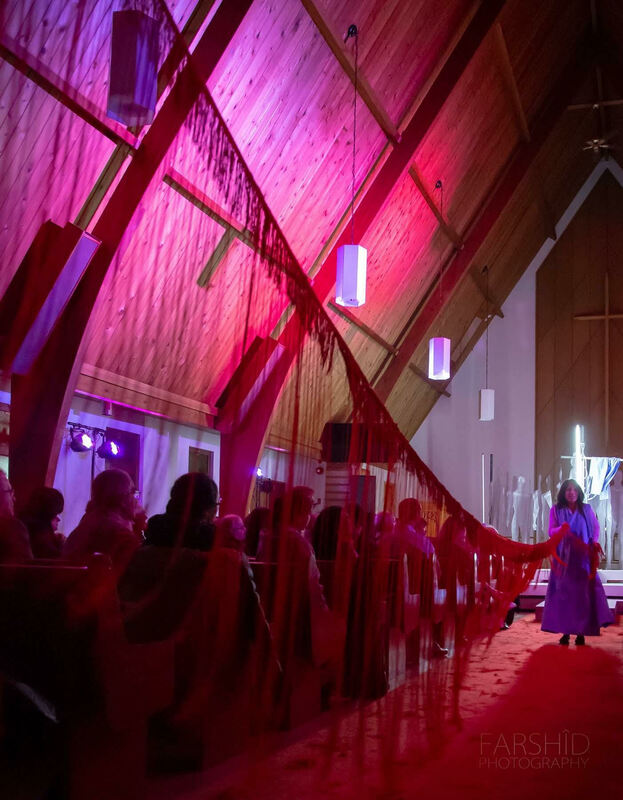 With a desert electronica rumbling inside the A-frame Agricola Lutheran church on Old York Mills Rd., the audience remained ensconced in a visceral, experiential performance—one that did not console or comfort, but provided many nuanced opportunities for serious reflection. The overall effect was a tremendous success and a large amount of the credit has to go to stage director Amanda Smith for her conspicuous readings of Bänoo Zan’s poetry, her direction of Sadiq and above all, for bringing the overarching narrative into sharp relief for all of us to grasp with ease. Conductor Maziar Heidari (who also wrote the overture depicting the chaos of migration and its realities of fear and uncertainty, orchestrated by Saman Shahi) guided the orchestra to some strong performance moments that subtly under girded the text. The Nov. 3rd performance in particular was conspicuous for its clear polyphonic textures and sonic beauty thanks to some rhythmically incisive interpretation and re-balancing of microphones across the small orchestra, credited to ICOT composer and technical director Pouya Hamidi. The resulting acoustical effect was important in creating the characteristic hues we needed to hear from Sadiq in a very live, A-frame acoustic, which played no small role in bringing the broader emotional effect of music and text into a fruitive union. Engaging in collaborative composition is not new in the history of opera, however to encounter it these days is comparatively rare. Rarer still is the remarkable collective that is ICOT, a group of five composers including Keyan Emami (the group’s president, who wrote Act III’s music), which formed seven years ago and has collaborated successfully on multiple projects. The group’s survival demonstrates a strong testimony to their successful and unique creative approach. I know of only one similar example in history, but it was made up of Russian composers (most of the famous Russian Five who banded together only once to co-compose a work titled Mlada, now lost). In the case of The Journey, each composer took a turn at composing an individual scene or act. For example, Saman Shahi wrote Act I; Act II, sc. ii, and also provided orchestration in select places. One of the most memorable highlights was the Saffron scene composed by the group’s Artistic Director, Afarin Mansouri. Barless drifting highlighted the gorgeous lyricism of Sadiq’s instrument in this scene. Its reverie for a spice world lost in the present, living on in a past dream, was not merely Sargardan’s nostalgia, but a powerful motivation to reconstitute her bloodline, heritage and faith. Sadiq unfurled a long, red-tasseled covering, suspended from the choir loft, down the church’s aisle to near the altar. Some saw it as blood, or even DNA, but in large part the fabric linked Sargardan’s many imaginative worlds within and without, for which the distinctive spice saffron served as a priming element for recalling her immersive experiences back home. Pouya Hamidi composed all of Act IV to a sturdy yet fluid narrative, set in fresh, expanded tonal and even partially modal languages. It worked strikingly well, especially as Sarganda exits to a line taken from the sacred Book of Hafez. I walked out singing that section of the opera to myself and remembered it for days. It was clear the collective worked as one composer, not five, drawing out the thread of a continuous musical story with skilled handling of orchestral textures in a direct, accessible style, well-layered so as to provide an artistic corollary to Bänoo Zan’s poetry. Sadiq’s tour-de-force singing and acting made the entire creative team’s work come alive. She was a remarkable performer both nights I attended. Blending traditional instruments with Western ones helped to make the performance the success it was, the sounds of Stravinsky and Reich with occasional Persian modes and lyrical tunesmithing intermingling well, but never reaching for kitsch. It reminded us all of a powerful human message: even when we leave home, never to return, we can find our way back without realizing it, albeit in a different way. The Journey was an authentic, moving experience.